Each module of each course is designed to take approximately 2-4 hours to complete on average although you can work entirely at your own pace and there are 10 modules for each part of the course and there are 3 parts all together. At the end of the last level there is a final exam consisting of multiple choice questions which can be completed and emailed directly to us. Also, as part of the requirements, there are also practical case studies that need to be completed and emailed to us. On successful completion of all these requirements, you will receive a “Certified Bowen Therapy Practitioner” certificate issued by Frank Navratil BSc. N.D. and the Return to Health International College of Natural Medicine. Go back to the main menu for information about the Return to Health International College of Natural Medicine. The Certified Bowen Therapy Practitioner course is internationally accredited with the IPHM (International Practitioners of Holistic Medicine). You can become a member of th IPHM once you complete our course. More information can be found on www.iphm.co.uk. On-line support for any problems or questions you may have during the course. Frank Navratil BSc. N.D. personally is available on-line to assist you during your Bowen Therapy course. 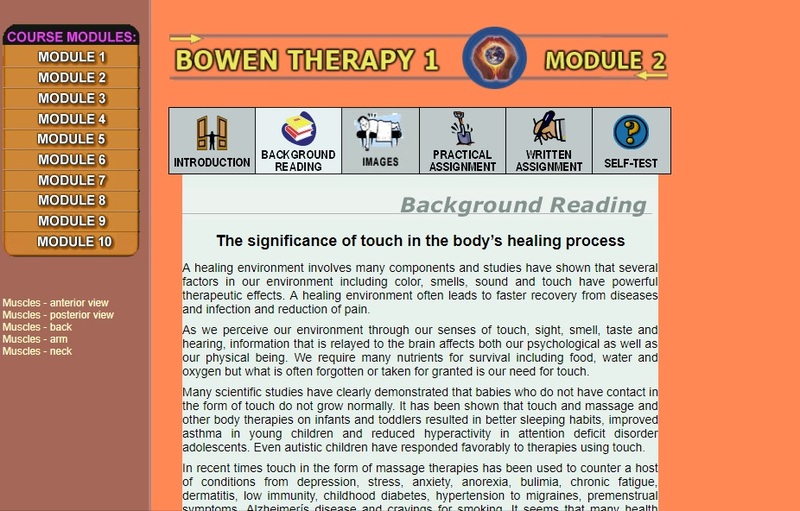 The second module of this course covers how touch is significant in the healing process introduction to the wonderful method of Bowen Therapy. It includes an explanation of the holistic wheel of health and the many ways our health is influenced. 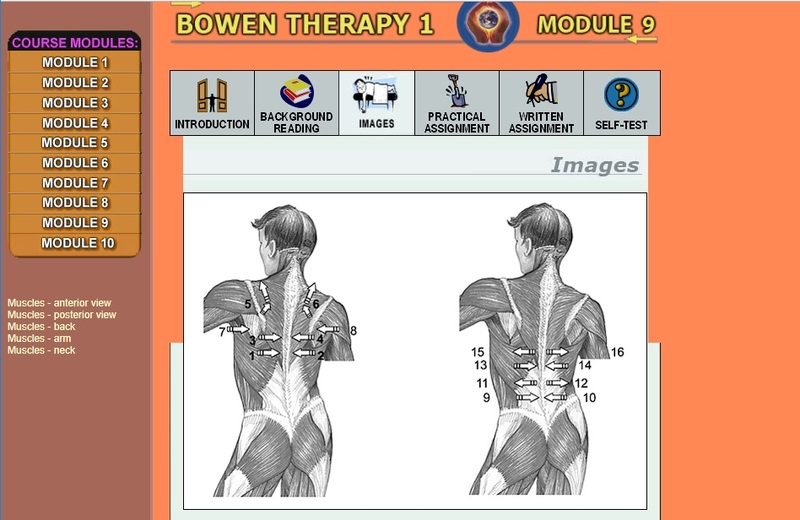 The third module of this course outlines the basic equipment required for Bowen Therapy and how to perform a client assessment. It includes essential information about Bowen Therapy as well as contraindications. Module4 covers the influence of nutrition on health, the various health conditions where Bowen Therapy can assist and questions that clients often ask before their first Bowen session. It also includes the benefits and positive effects of Bowen Therapy. Module5 of this course covers essential protocol for the Bowen therapist after the Bowen session, negative reactions and the healing crisis. It includes reasons why Bowen Therapy may not always result in success. Module6 of this course covers the meaning of stress and the role of Bowen Therapy. It includes common psychological reactions that clients may have after Bowen Therapy. Module7 of this course covers anatomical position and directions of moves. It also includes an in-depth explanation of how to perform the basic Bowen move as well as information on 2-minute breaks, breathing and procedures. Module8 of this course covers the first of the three Basic relaxation procedures, the Lower Back Procedure. It includes preparation before the procedure, an explanation of how to practically perform each of the moves of the procedure as well as health problems that may be assisted. Module9 of this course covers the second of the three Basic relaxation procedures, the Upper and Mid-Back Procedure. It includes preparation and prerequisites for the procedure, an explanation of how to practically perform each of the moves of the procedure as well as health problems that may be assisted. Module10 of this course covers the third of the three Basic relaxation procedures, the Neck and Shoulders Procedure. It includes preparation and prerequisites for the procedure, an explanation of how to practically perform each of the moves of the procedure as well as health problems that may be assisted. The first module of Level 2 covers the Upper Respiratory and Temporomandibular joint procedure. It includes preparation and prerequisites for the procedure, an explanation of how to practically perform each of the moves of the procedure as well as health problems that may be assisted. The second module of Level 2 covers the Knee procedure. It includes preparation and prerequisites for the procedure, an explanation of how to practically perform each of the moves of the procedure as well as health problems that may be assisted. The third module of Level 2 covers the Frozen Shoulder procedure. It includes preparation and prerequisites for the procedure, an explanation of how to practically perform each of the moves of the procedure as well as health problems that may be assisted. Module4 of Level 2 covers the Respiratory procedure. It includes preparation and prerequisites for the procedure, an explanation of how to practically perform each of the moves of the procedure as well as health problems that may be assisted. Module5 of Level 2 covers the Hamstring procedure. It includes preparation and prerequisites for the procedure, an explanation of how to practically perform each of the moves of the procedure as well as health problems that may be assisted. Module6 of Level 2 covers the Pelvic procedure. It includes preparation and prerequisites for the procedure, an explanation of how to practically perform each of the moves of the procedure as well as health problems that may be assisted. Module7 of Level 2 covers the Coccyx procedure. It includes preparation and prerequisites for the procedure, an explanation of how to practically perform each of the moves of the procedure as well as health problems that may be assisted. Module8 of Level 2 covers the Kidney procedure. It includes preparation and prerequisites for the procedure, an explanation of how to practically perform each of the moves of the procedure as well as health problems that may be assisted. Module9 of Level 2 covers the Sacral procedure. It includes preparation and prerequisites for the procedure, an explanation of how to practically perform each of the moves of the procedure as well as health problems that may be assisted. Module10 of Level 2 covers the Headache procedure. It includes preparation and prerequisites for the procedure, an explanation of how to practically perform each of the moves of the procedure as well as health problems that may be assisted. The first module of Level 3 covers the Elbow and Wrist procedure. It includes preparation and prerequisites for the procedure, an explanation of how to practically perform each of the moves of the procedure as well as health problems that may be assisted. The second module of Level 3 covers the Breast Tenderness procedure. It includes preparation and prerequisites for the procedure, an explanation of how to practically perform each of the moves of the procedure as well as health problems that may be assisted. The third module of Level 3 covers the Ankle procedure. It includes preparation and prerequisites for the procedure, an explanation of how to practically perform each of the moves of the procedure as well as health problems that may be assisted. 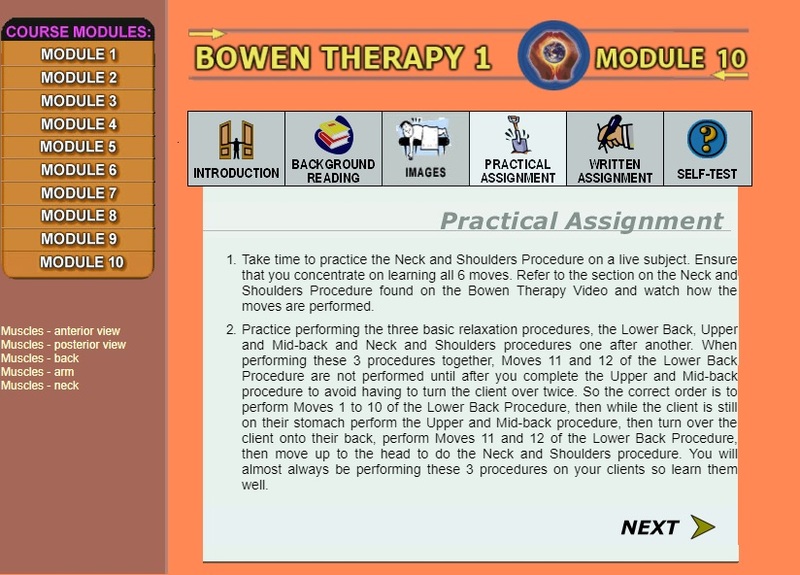 Module4 of Level 3 covers information about combining Bowen Therapy procedures. It includes guidelines for combining procedures and examples, as well as recommended procedures for over 50 health conditions. Module5 of Level 3 covers relaxation and safety during Bowen Therapy. It includes guidelines on how to ensure that your client is in a relaxed state as well as how to ensure their maximum safety. Module6 of Level 3 covers moral and ethical issues in Bowen Therapy. It also includes some ethical and moral case studies in relation to the practice of Bowen therapy. Module7 of Level 3 covers positive and negative energy during Bowen Therapy. It includes an explanation of what positive and negative energy means as well as methods of how to ensure that you do not deplete your energy levels while performing Bowen therapy when clients bring in with them different levels of energy. 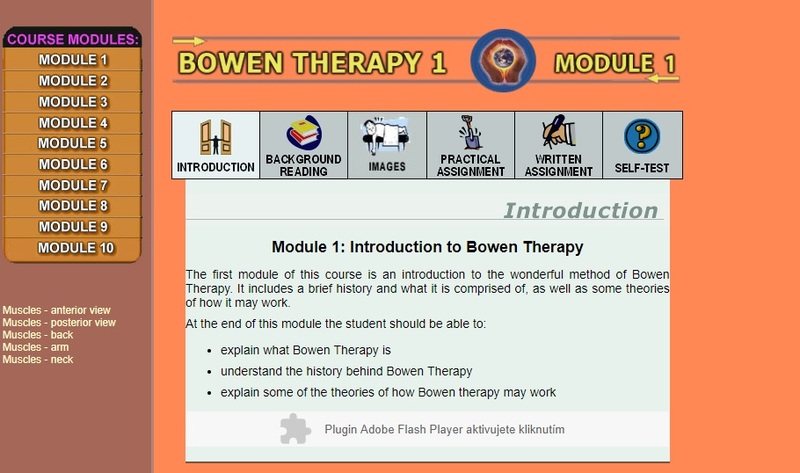 Module8 of Level 3 covers some special thoughts and conditions concerning Bowen Therapy. Module9 of Level 3 covers some case studies taken from the naturopathic practice of Frank Navratil BSc. N.D. It includes a sample of some cases of male and female patients with various health problems, where Bowen therapy has been successful. 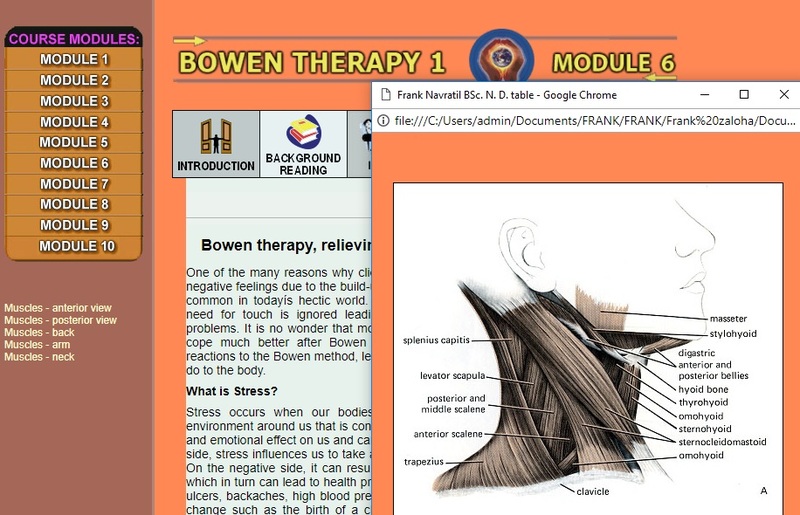 Module10 of Level 3 covers a summary review for Part 1, 2 and 3 of the Bowen Therapy course. It includes summaries of each of the modules on the 3 CD-ROMs. Please note: This examination must be emailed or sent by post to be corrected. 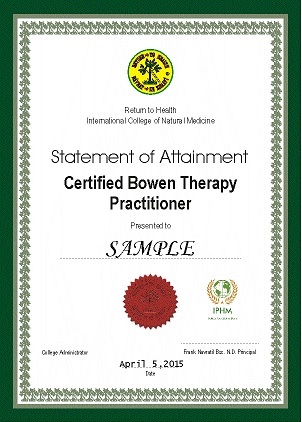 You must achieve a score of 80 percent or more to receive your Bowen Therapy Practitioner certificate. As well as this you are required to send us 5 case studies on 5 different clients. On successful completion, this certificate will be mailed to your address. You will be notified if you are unsuccessful after which you will need to resubmit your exam. There is no limit to the amount of times that you can apply for the certificate. There will be 100 multiple-choice questions. 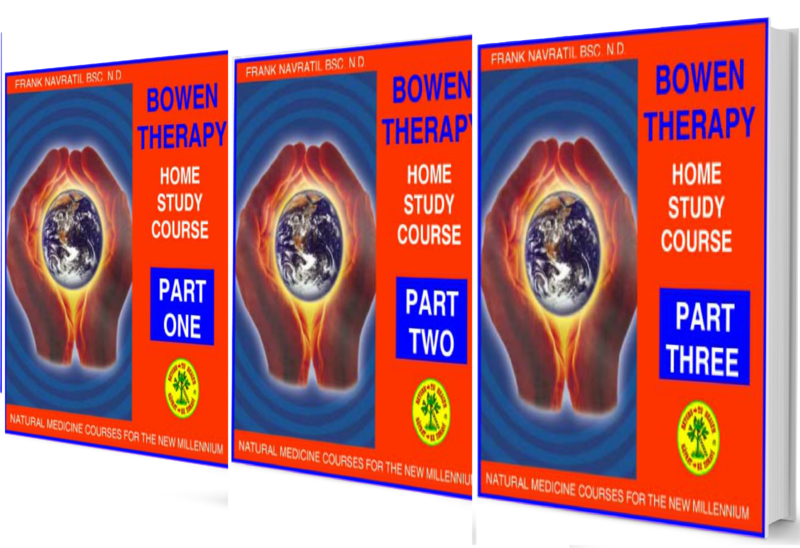 The Bowen Therapy Video is included as part of the Bowen Therapy home-study course. This video is the only one of its kind available in the world.